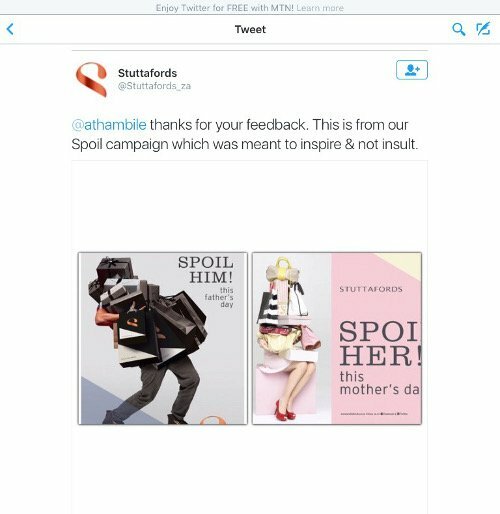 I made my discomfort known to Stuttafords via Twitter only to be told the ad is part of a larger “Spoil campaign” with images of men and women whose faces and bodies have been replaced with shopping bags. I guess the advert got my attention but for the wrong reasons. 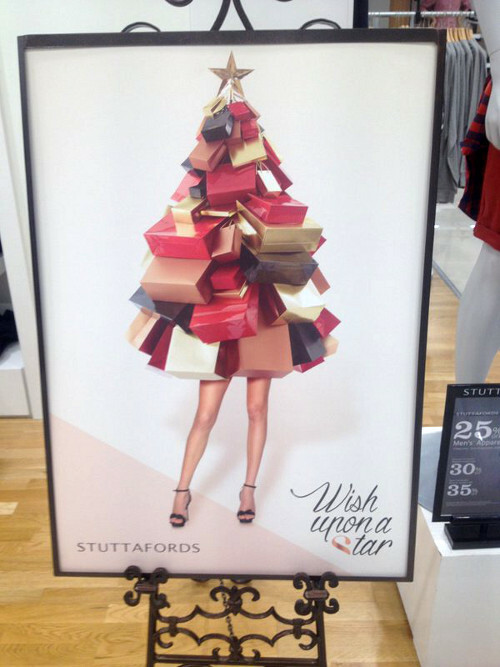 My initial outcry was the fragmented female body but the campaign features a fragmented male body as well. This does not make the advert any more palatable but more dangerous. The fragmentation of the body in the name of consumerism highlights the consequences of the lifestyle: that we are in fact dehumanised by the need to consume objects we probably don’t need. Exaggerating is a strong feature in advertising but in the “Spoil campaign” case I think it’s inadvertently illuminating about the state of our humanity in a consumerist society. I was then struck by a Pep advert on television about quick and easy loans — you can simply walk into a store with an ID. This is not the first ad of its kind (there’s one about a guy in a taxi who gets rejected by the bank and discovers Pep loans after all his efforts). What caught my attention was the use of the black, working-class woman caricature (or stereotype). It shouldn’t be a surprise that this image is used given the target market and the customers of Pep stores. It’s the same kind of woman used to advertise washing powder and chakalaka. Instead of offering poor, black women a way to save the advert — before Christmas — encourages debt. It highlights the lack of regard for a group of marginalised people who need financial security. I am yet to see an advert about a service that encourages stokvel savings (many black women are part of stokvels) rather than the usual image of the poor, black woman who must consume blindly even though we know in reality this kind of consumption has dire consequences. Right at the beginning of the festive season Shoprite had a Christmas advert with a striking, cute, black girl. She was light-skinned to the point where I noticed the yellowing of her skin. Perhaps it’s the lighting used in the advert to highlight the happiness associated with Christmas shopping but her skin tone made me question the kind of babies that are used in adverts: mostly white children and if there are black children they often appeal to the aesthetic of whiteness with excessively light skin because white babies are more palatable to the consumer (the Telkom ad with the baby with the Afro also falls into the category of yellow-looking children). This shouldn’t be a surprise seeing that many of the black people in advertisements are light-skinned black people. They are often referred to as “yellow bones”: an offensive term initially used to describe light-skinned women to highlight their attractiveness. This is colourism. Alice Walker coined the phrase to explain the “discrimination within communities of colour towards those with darker skin”. This is dangerous given the skin-lightening industry in South Africa and the rest of the continent. And now young children watching TV are getting a strong message about what it means to be pretty and cute. Colourism affects women mostly. Dark black men are seen as attractive (think alcohol adverts in smoky rooms and pubs with dark chocolate-skinned men). The obvious problem with colourism is its link to whiteness as the standard of beauty: the closer a black person is to whiteness, the more desirable they are. I could list more adverts that perpetuate negative stereotypes and racist ideas about beauty and attractiveness. Perhaps this is the purpose of advertising: to confirm our reality as consumers so that we can rely on the same tropes that define our reality. Heaven forbid advertising challenged our reality.